Maruti is one of the biggest car maker companies and especially in India it comes first in car making, and also the most trusted brand in India. This is because of the quality and service provided by this company, in 2005 maruti launches its most awaited car Maruti Suzuki Swift, about 30 lakh units of this car has been sold till date and about 45% of this car has been sold in Indian market. So this car can be declared as one of the most successful and trusted product by maruti, the reason of this sale is the design, engine, power and performance of this car. Now maruti is launching its new version of this car named as Maruti Suzuki Star. Some changes have been implemented in this car with a small increase in the price. Maruti Suzuki Swift comes in both petrol and diesel variants, the petrol version comes with 1.2-litre K series engine which provides displacement of about 1198cc, this engine comes with VVT (variable Valve Timing) technology which makes it highly fuel efficient and breath freely, and perform optimally. This engine gives mileage of about 18.6 Kmpl according to ARAI test which is an impressive one. And the new swift is 4% more fuel efficient than the previous one. The diesel version of the same car is powered with 1.3-litre DDiS engine which provides displacement of 1248cc this engine comes with superior technology which makes this car highly fuel efficient it has DOHC (Double Overhead Camshaft) technology which ensure proper valve opening and closing. DDiS (Direct Diesel Injection System) which is the version of CRDi (Common Rail Direct Injection) help to have better fuel economy; it offers about 22.9 kmpl as per the ARAI test. Maruti Suzuki Swift comes in both petrol and diesel variants; the petrol version comes with 1.2-litre K series VVT engine, this car has – speed manual transmission gear box which one reverse, the engine is very advance and powerful then the previous model, it has MPFI (Multi Point Fuel Injection) technology which help to deliver optimum performance and economical fuel combustion, it has power of about 86bhp at 6000rpm which is impressive and torque is about 114 Nm at 4000rpm. So we can say this is a completely improved version of previous swift. The diesel version of this car is extremely powerful and the performance is very good with respect to the previous version. The rear seems to be modified this time the LED tail light gives it the perfect finishing. And when we talk about interior this is a car with enough space, the stereo system is simply marvelous u can enjoy each and every beat of the music the speedometer is digital, AC is very powerful. And many other special feature which makes this car and ultimate creation. As per my suggestion if you are planning for a low budget car you should go for this, since it provides feature of a luxury car. 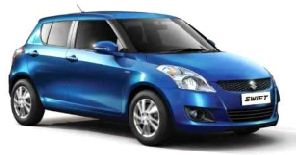 I think Maruti swift star will surely take the brand name of maruti to top since it is perfect car.